The nasal Ring–Adair–Elwyn (RAE) tube is a preformed tube, especially designed for oral, head and neck or maxillofacial surgeries. It allows manipulation of the mandible and occlusion with the maxilla without interference by the tracheal tube and provides for better visualisation of intraoral structures. Nasal RAE tubes are angled away from the surgical site. Correct placement of the tracheal tube can be confirmed by capnography, fibreoptic endoscopy and direct visualisation of the tube passing between the vocal cords. In centres where such facilities are not available to check correct tracheal placement, direct visualisation of the tracheal tube is mandated. The U-shaped kinking of the tracheal tube within the trachea (distal to the vocal cords) can be misleading and catastrophic if undiagnosed by the anaesthesiologist. In our case, we tried repositioning the tracheal tube a second time, but ventilation was not possible on both occasions despite the tube being inside the trachea. A situation of this kind might confuse the anaesthesiologist and prompt the consideration of other causes of failed ventilation such as chest wall rigidity or bronchospasm, leading to subsequent mismanagement of the actual problem. Intraoperative ventilatory failure or inadequate ventilation following nasotracheal intubation with nasal RAE tube could be due to inadequate insertion or acute obstruction by blood clot, secretions, mechanical kinking or misplaced tube. 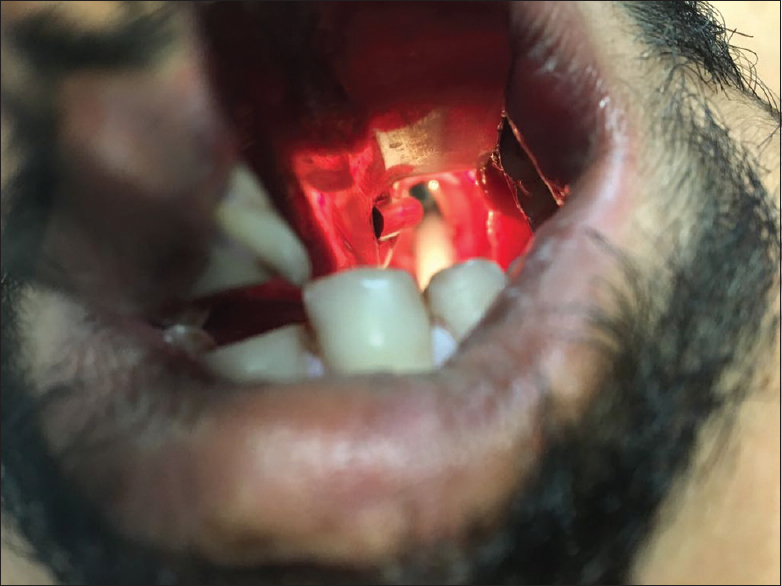 A 25-year-old male patient (ASA 1) male patient was posted for mandibular and maxillary reconstruction following facial trauma. Written informed consent was obtained. Standard monitors, including electrocardiogram, noninvasive blood pressure, pulse oximeter and temperature, were applied. Following preoxygenation, general anaesthesia and muscle relaxation were induced by weight-adjusted intravenous administration of midazolam, fentanyl, lignocaine, propofol and vecuronium. The patient was then intubated through the right nostril with a 7.5-mm ID previously used sterile nasal RAE tube. Gentle laryngoscopy revealed a Cormack–Lehane Grade 2. The tube was inserted under vision between the vocal cords, fixed at 28 cm at the level of nares and was connected to the Bain circuit. There was no chest rise and increased resistance was felt during manually assisted ventilation. On auscultation, bilateral air entry was markedly reduced and the chest rise was inadequate even at higher ventilatory pressures. Oxygen insufflation was continued while the cause of failed ventilation was being evaluated. An 18 FG suction catheter passed through the tube failed to pass beyond 18 cm and suctioning did not reveal any mucous plugs, blood or secretions. A repeat laryngoscopy revealed the tracheal tube passing between the vocal cords and the tube was placed well within the trachea. The tracheal tube was partially withdrawn and reinserted, but the patient could still not be ventilated. A repeat laryngoscopy showed the tube within the glottic opening, folded back on itself in a U-shaped manner, with the distal lumen of the tube facing towards the vocal cords [Figure 1] and [Figure 2]. During this period, SpO2 was maintained at 90%, heart rate at 120/min and blood pressure at 150/96 mm Hg. The patient was immediately extubated and ventilated with bag and mask before reintubating with another fresh nasal RAE tube of the same size. Ventilation was now possible with adequate chest rise and bilateral equal air entry on auscultation. The vital parameters were restored to normal baseline values. Surgery and anaesthesia thereafter were uneventful. The patient was extubated at the end of surgery without any complications or sequelae. Causes of inadequate ventilation following nasotracheal intubation could be most commonly due to inadequate depth of insertion and accidental extubation. Although smaller-sized tube needed for nasal intubation could cause inadequate ventilation, smaller endotracheal tubes are also considerably less resistant to the edge compression than tubes of larger dimension. Mechanical kinking and obstruction due to secretions, mucous plugs and blood are other causes of failed ventilation. Kinking of the endotracheal tube can be caused by improper positioning of the patient during surgery and thermal softening of the tube., Kinking of the endotracheal tube occurs mainly outside of the mouth with kinking of the intraoral portion, specially intratracheal, rarely reported. 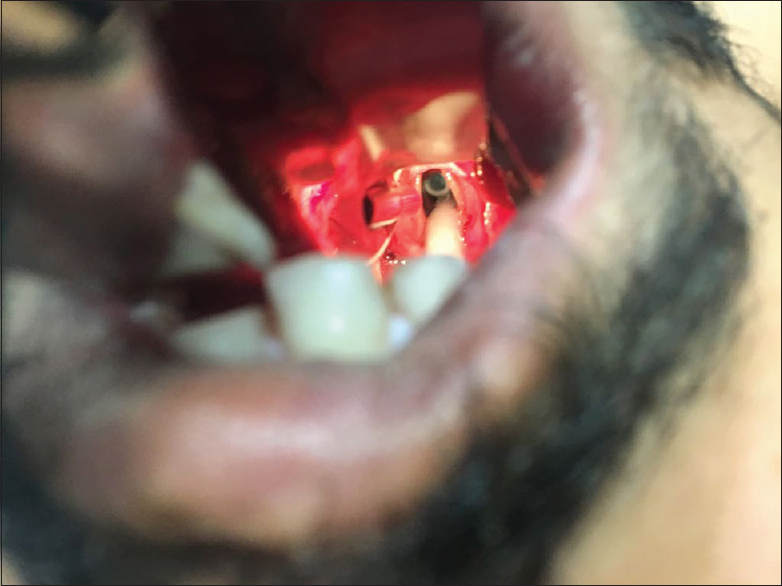 A U-shaped folding of the ivory polyvinyl chloride (PVC) tube below the vocal cords is a rare cause which is difficult to detect, can be easily missed and may lead to dangerous desaturation of the patient. Surprisingly, a kinked tube may not show a measurable flow hindrance immediately. Such situations are best diagnosed rapidly by visible chest rise, auscultation of breath sounds and capnography. On suspecting any such situation, the following measures should be undertaken immediately. Nitrous oxide should be turned off and the patient ventilated with 100% oxygen. A suction catheter should be inserted through the tube to check its patency. Fibreoptic examination would provide valuable inputs or else a careful laryngoscopic visualisation could identify tube kinking. Except fibreoptic examination, all other steps were carried out in our case. PVC tubes are meant for single use only and should not be autoclaved or sterilised for multiple use as it may lead to softening and therefore kinking or folding in case of blind nasal intubation. Use of a stilette for a nasal RAE tube is not possible because of the preformed shape, and hence, inadvertent oesophageal intubation may cause ventilatory insufficiency in case of blind nasal intubation. Vigilance, combined with the presence of mind and clinical judgement, is of paramount importance to avoid unanticipated airway mishaps. Davies RM, Scott JG. Anaesthesia for major oral and maxillofacial surgery. Br J Anaesth 1968;40:202-8. Nilsson K, Stenqvist O. Flow resistance of endotracheal tubes during kinking and compression. An experimental study. Med Prog Technol 1985;10:249-54. Sprung J, Bourke DL, Harrison C, Barnas GM. Endotracheal tube and tracheobronchial obstruction as causes of hypoventilation with high inspiratory pressures. Chest 1994;105:550-2. Park J, Lee KH, Wang W, Jung SW, Choi JH, Lim HK. Intraoral kinking of an endotracheal tube during position change in a patient with tracheal deviation. Case Rep Int 2018;7:100043CRINTJP2018. Hübler M, Petrasch F. Intraoperative kinking of polyvinyl endotracheal tubes. Anesth Analg 2006;103:1601-2. Leissner KB, Ortega R, Bodzin AS, Sekhar P, Stanley GD. Kinking of an endotracheal tube within the trachea: A rare cause of endotracheal tube obstruction. J Clin Anesth 2007;19:75-6. Paul M, Dueck M, Kampe S, Petzke F. Failure to detect an unusual obstruction in a reinforced endotracheal tube with fiberoptic examination. Anesth Analg 2003;97:909-10.